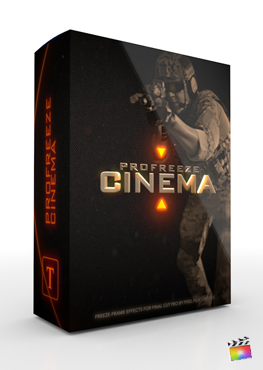 ProFreeze Cinema is a cinematic set of freeze-frame tools made for Final Cut Pro X. With ProFreeze, create epic still-frames from within a video clip to create a professional freeze-frame effect. Use ProFreeze Cinema to introduce action stars, friends, or notable people of any kind with legendary stylings and smooth animations. ProFreeze Cinema is exclusively for Final Cut Pro X.